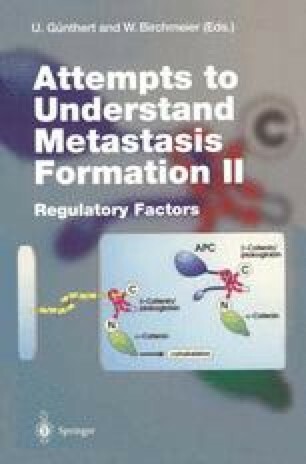 The brain is a unique target for tumor invasion and metastasis formation (Steck and Nicolson 1993; Nicolson 1993a; Menter et al. 1995a; Nicolson et al. 1994b. The central nervous system (CNS) is confined by the skull, and the brain is highly sensitive to the slightest change in the local microenvironment. The brain is also surrounded by a formidable blood-brain barrier (BBB), which does not allow penetration of most cell types. Because the brain lacks lymphatic drainage, cerebral edema is a major complication resulting from tumors in the CNS. When tumors form in the brain, either from endogenous brain cells or from metastases invading the BBB, they are very difficult to successfully treat. Therapy of brain tumors and metastases are often only palliative and are often accompanied by additional complications. A relatively small tumor in the brain cavity can cause severe symptoms, including impaired cognition, headaches, seizures, and eventually paralysis.